Jabir ibn Aflah is often known by the Latinised form of his name, namely Geber. Although not he was not in the first rank of Arabic mathematicians, he is important in the development of mathematics since his works were translated into Latin, and so became available to European mathematicians, whereas the work of some of the top rank Arabic mathematicians such as Abu'l-Wafa were not translated into Latin. Very little information is available regarding Jabir ibn Aflah's life. That he came from Seville is known from two sources. Firstly he is described as "al-Ishbili" in manuscripts containing his treatises; this means "from Seville". The other source gives us not only the information that he came from Seville, but also a good estimate for the period in which he lived. The information comes from Maimonides. 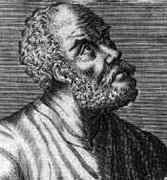 Jabir ibn Aflah invented an observational instrument known as the torquetum, a mechanical device to transform between spherical coordinate systems (see  for further details). He also gave his name to a theorem in spherical trigonometry, and his criticisms of Ptolemy's Almagest Ⓣ are well known. These criticisms appears in Jabir ibn Aflah's most famous work Islah al-Majisti Ⓣ. One sees that ibn Aflah even puts his argument regarding errors made by Ptolemy into the title of the work. In  Lorch explains Jabir ibn Aflah's most famous criticism, namely Ptolemy's placement of Venus and Mercury below the Sun. Ptolemy claimed that these planets could never be on a line between an observer on Earth and the sun., but ibn Aflah states that this is an error, and that Venus and Mercury are above the Sun. It is a little difficult to establish the exact degree of originality of Correction of the Almagest. Certainly its general approach bears considerable similarity to the work of Abu'l-Wafa, but it may not be based on Abu'l-Wafa's work. Both may be based on the work of Thabit ibn Qurra, or the work of ibn Aflah, Abu'l-Wafa, and Thabit ibn Qurra may all be based on some still unknown source. The influence of ibn Aflah is quite remarkable. In  his influence on astronomers in both the East and West is studied. In particular the author looks at his influence on the Persian astronomer Qutb al-Din al-Shirazi, who was a pupil of Nasir al-Din al-Tusi; on the Hispano-Arabian philosopher ibn Rushd, who is often known as Averroes, was born in Córdoba in 1126 and integrated Islamic traditions and Greek thought; and on Levi ben Gerson (sometimes known as Gersonides). One of ibn Aflah's more infamous influences was on Regiomontanus who copied large parts of ibn Aflah's work in the fourth book of his publication De triangulis. Regiomontanus did not acknowledge that ibn Aflah was the source of the material and this caused Cardan to strongly criticise Regiomontanus.